Just before the holidays and like the Grinch who stole Christmas, the Trump Administration’s release of its new federal lead strategy (the Federal Action Plan to Reduce Childhood Lead Exposures and Associated Health Impacts) threatens to steal the gift of a bright and lasting future away from the nation’s children, a future that should be free of lead poisoning. With over half a million children still having too much lead in their blood, parents, scientists, advocates, and many others who have worked tirelessly over decades to reduce children’s exposures had hoped for new, aggressive action to finally address a problem that is entirely preventable. Instead, the new document opens with how much progress has been made—as if most of the problem is behind us—instead of focusing on what remains to be done. With over 37 million homes with lead paint and over 10 million with lead pipes, the problem remains widespread. The last time the federal government spoke with a unified voice on this issue, back in 2000, there was a clear 10-year plan to address the problem, a scientifically rigorous forecast, and (perhaps most important) an interagency budget request. This new document contains no new goal, no new resources to address the problem, no innovation or real commitment. EPA, in particular, has dragged its feet. Its previous administrator, Scott Pruitt, declared a “war on lead,” but these were empty words. The new administrator has refused to even meet on the subject with its scientific career staff and has sidelined its own top expert. The document promises new EPA lead dust standards, but this promise has been around for 10 years now; and the new standards it proposed last year were only done after a court ordered it. The document discusses better targeting, as if the problem is confined only to a few “hot spots,” when in reality the problem is nationwide. A Reuters study showed that there are thousands of jurisdictions with lead problems even worse than Flint. Despite what is, frankly, a pathetic excuse of a new federal lead strategy, there are rays of hope elsewhere. Citizens have rightly denounced what happened in East Chicago, Flint, and elsewhere. Dramatic calls for action and new policies have been issued. The “Find It, Fix It, Fund It” campaign, launched by the National Center for Healthy Housing, the National Safe and Healthy Housing Coalition, and over 150 other supporters across the land, provided key recommendations and science-based policies. A recent report from Pew Charitable Trusts, Robert Wood Johnson Foundation, and others demonstrated not only the need to take action but also that we could save both money and livelihoods. Congress acted last year to dramatically increase appropriations for lead poisoning prevention and reversed the Trump Administration’s attempt to zero-out the lead poisoning prevention program at EPA. And hundreds of career scientists and others in the federal government remain committed to solving the problem. 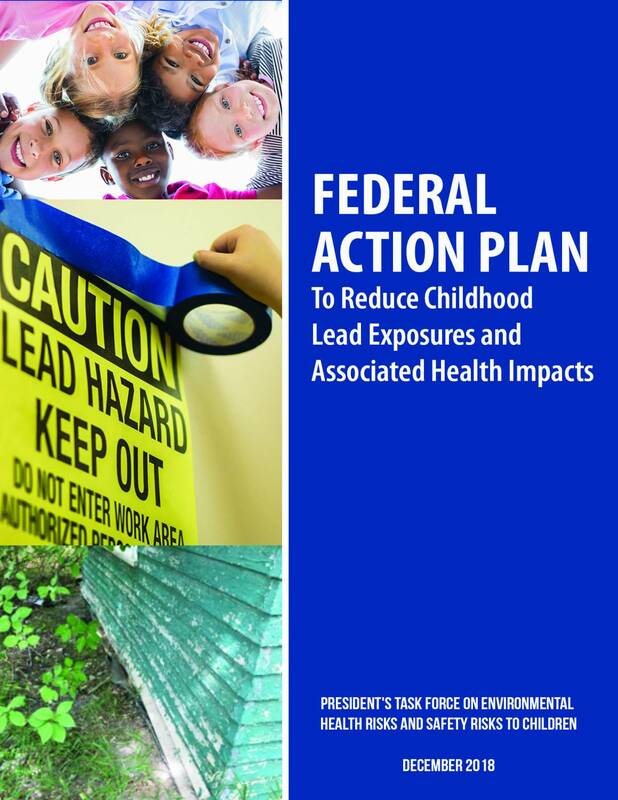 The federal lead strategy released today does little to support the leadership at CDC or HUD as they commit to taking on the overdue goal of eliminating unnecessary lead exposure (examples here and here). We have the science, we have the solutions, we have armies of public health and housing professionals across the country who are poised to do the right thing, and we have committed program staff in key federal agencies. Lead poisoning is a problem we can and should solve, but it will require a commitment at the highest levels to help put those resources and solutions into action. An army can’t march without its general and can’t win without a viable strategy. The National Center for Healthy Housing calls on citizens to take new action, not the fakery in the new federal lead strategy. We should ensure that houses are inspected before children are poisoned, not just after exposure has already occurred. We should make sure that mortgages, taxes, and other financial systems work to help parents protect their children, not ignore the problem and carry on, “business as usual.” We should ensure that taxpayer dollars are not used to subsidize homes that put children at risk. We should support those in Congress who are trying to get something done. We should demand that our local and state government representatives do more. We strongly encourage everyone interested in real solutions to contact your members of Congress and other elected officials; for information on how to do that, visit this page or contact Sarah Goodwin at sgoodwin@nchh.org. The solutions to this problem are known. We should act on what we know to ensure our children are not saddled with a future of lead poisoning but instead have a future where they are the best and the brightest they can be.